Meet the first member of the modern Oktava family, the MK-101. Introduced in 2004 as a transition from earlier models, the MK-101 retains some of the vintage character of the popular MK-219/319 (almost 100,000 sold) but offers transformerless output clarity. Building on the marketplace success of the legendary MK-012, (over 90,000 in use worldwide) the MK-101 uses the same impedance converter / output circuit and body design made famous by the MK-012. On Axis – The MK-101 offers a powerful midrange presence and natural top end response with excellent rejection of sibilance. 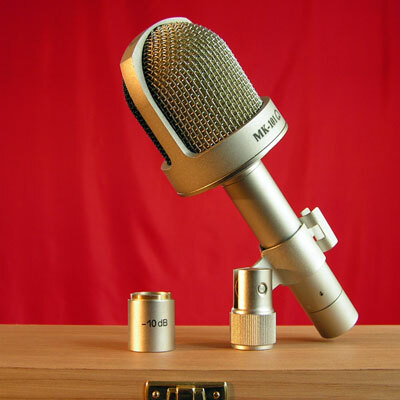 Off-Axis - The MK-101 has moderate attenuation at 90 degrees giving the mic a wide cardioid pick up pattern. 180 degree response has a warm spectral balance with strongest output below 200Hz, smooth amplitude reduction to 3 kHz followed by a moderate high frequency ambient sound presence peak. The MK-101 excels on vocals or guitar cabinets where the recordist wants classic midrange presence, sibilant-free top end and a warm room sound with just a touch of top end room presence. ... I bought the MC101 about three weeks ago. I never heard of it before, but I knew the MC012 which I really love and use for stereo-recordings as well as for overhead- and ambience-micing. I used the MC101 with voice, acoustic guitar, electric guitar and snare drum and it just sounded great in all these situations. I compared the MC101 to the Oktava "Lomo-Head" and I personally like the MC101 even better. I also compared it to a Neumann U87 and to me it sounded very similar. After all, Iґm going to get me a second MC101 so I can do stereo-recordings with these great microphones. ... I’m pleased with the sensitivity of a microphone. I’ve tried to record ambience first of all – a very low self-noise level, excellent legibility of a sound. It sounds almost like MK-319, but I like the voice timbre better. High frequencies are precise and clear, the low-range is also legible and not blurry. The announcer recording has turned out rather impressive. I can tell secretly, that I like my own voice, recorded with this microphone. I couldn’t record it normally before. The microphone receives both the man's and female vocal very truthfully. MK-101 reproduces all timber nuances of a guitar-sound, you should only choose a pick-up point correctly. Thanks to cardioid pattern it pointed towards low frets of the finger-board. The result can be processed afterwards anyhow and anyway. No complaints. Can be used as a universal studio microphone. ... The microphone has a very well balanced frequency range. In comparison with MK319A it reproduces high frequencies from 2kHz more qualitatively, it distinguishes them sharply, without whispering. It reproduces low-range honestly und has better noise protection. The microphone can be used without windscreen. Thanks! I am pleased with it.